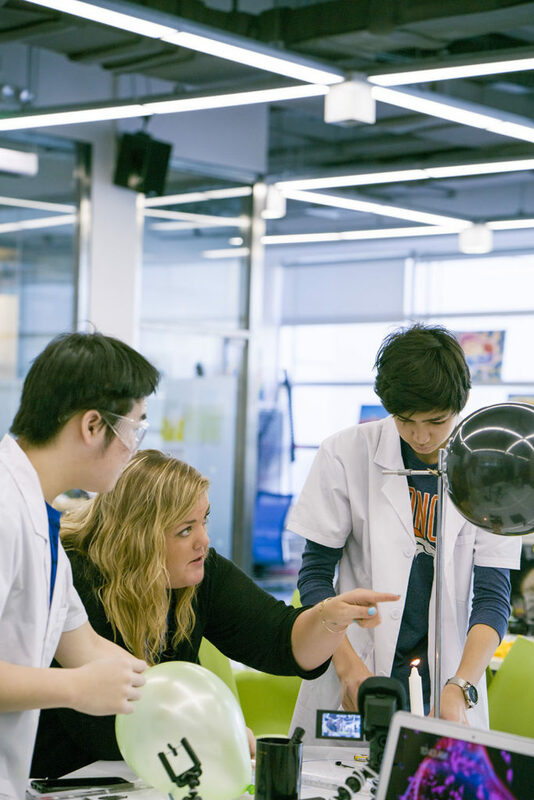 Upon entering the Futures Academy (FA) at the International School of Beijing (ISB), it seemed like something between an art class and a science lab, and a far departure from the classrooms we grew up in as kids. There was no “sage on a stage” or giant overwhelming blackboard, just a room filled with tech, circular tables, and happy kids. We were very impressed with the colorful and creative atmosphere that filled the room, as students looked very focused, working intently with a variety of the tools that they had available to them ranging from laptops, 3D printers, audio equipment, and cameras. Now going into its fourth year, FA has a lot to be proud of as it begins the 2017-18 school year, bringing more students into the mindset of 21st-century learning. But, like all movements in education or elsewhere, the ISB Futures Academy started as an idea: an idea based on wanting to give students the ability to become the architects of their own learning, and encouraging them to experience a different form of education that is equally about developing proficiency in academic standards as it is about learning to be creative problem solvers. But, with over 1,700 students and 150 teachers at ISB, we were curious about how a redesign like this was initiated. After all, it was necessary that ISB created a program which didn’t completely negate the standards-based curriculum, but would rather complement and reinforce it, by providing a testing ground for educational practices which could later be integrated into the entire school. Also, it was evident to the founders of Futures Academy that if they decided to implement these new learning concepts throughout the entire curriculum, it would have taken years of planning to introduce, and probably be met with some skepticism. If they chose to start the new way of learning in primary school, there’s a chance that the maturity needed for this kind of academic freedom had yet to surface in the student. On the other hand, if it were started too late, then maybe the benefits wouldn’t have enough time to take hold, especially with the added pressure of IB and college prep. That’s one of the reasons why they chose to start with Grade 7. So far, with each year the program has been gaining traction and is currently at 88 students in Middle School, and ten students in Grade 9. If the student decides to stick with FA, the complexity and nature of the project-based curriculum mature along with the student. A day in the life of an FA student is usually broken up into three blocks (90 minutes each), and two half-blocks (45 minutes each). Two-thirds of these full blocks are spent in FA developing projects, and the other is either in Art or PE. The half-blocks, which occur before and after lunch, are when students do their enrichments (Chinese, orchestra, robotics, etc.) with the rest of the middle school. As for the core subjects such as math, science, and humanities, these are all integrated into the projects, though in a less linear way than students are typically accustomed to. So while the rest of the middle school may teach unit 1-6, FA will mix it up a bit to better integrate these lessons into the student’s projects. Jazzy, a Grade 8 student said; “We integrate subjects into our projects, but it’s not like ‘turn to page 80,’ it’s more about finding things as they relate to the topic of your project.” So while at first glance it may seem that life as an FA student is a huge departure from the standard, these subjects are just presented through more creative and less conventional methods. After all, the plan is not only to gain mastery of core academic subjects but also to engage with individualized learning which is specific to the student’s passions and interests, helping the act of learning to become a more organic process. One of the essential ingredients of FA, we were told, is something called L21. This is in many ways the academic backbone of ISB that exists in their framework from Pre-K3 to Grade 12, and attempts to layer purpose and vision on top of academics. FA has a particular focus on these concepts, that range from communication and collaboration, creativity and innovation, global and critical thinking, and leadership responsibility. It’s combining these ideas with academic standards, technology, comprehensive assessment, and various types of learning, including project based, experiential, and even learning on a more social and emotional level that ISB believes will help prepare students for the challenges of the future. Students explore their respective topics with guidance from their teachers, gather data in the field, and probe further to connect their projects to other areas of study. This allows them to get to know their topic, while learning essential skills like writing surveys, interviewing experts, and using the information they have gathered to write a complete analysis of the subject which they will eventually have to defend at the project’s conclusion. To us, this sounded more like something from a university dissertation rather than a middle school classroom, and we were quite impressed by the level of independence these young students were working at. Dr. Tarek Razik explained, “As a teacher it used to be ‘here’s the knowledge, I’m going to give it to you, and then you’re going toggle it back to me on a test’. But now as a facilitator what I’m going to say is ‘here’s what I want you to be able to do, now how can I help you do that?’ While the teachers still need to teach to the standards, how that happens is up to them.” This puts a lot of added responsibility onto the teachers to make sure the students are delivering, but also it allows them to be creative and use every tool at their disposal to make this happen. This is how FA became what it is today, an incubator for new ideas about education. Less constrained by the old status quo, the program has become a testing ground for new ideas and teaching methods, which has provided these young minds an alternative way to learn, not to mention a first glimpse at the curriculums of the future. Only time, and full-on implementation of this educational style, will tell if this is the actual direction of 21st-century learning, but from our observations at FA we are excited about the possibilities. This article originally appeared on p 54-56 of beijingkids August 2017 issue.